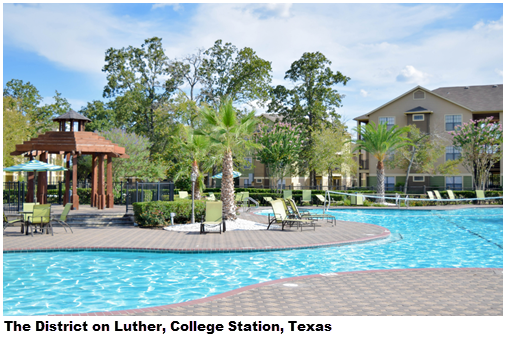 ​​ CORPUS CHRISTI, COLLEGE STATION - A portfolio of eight student housing assets totaling nearly 5,000 beds in five states for $72 million from Campus Advantage Inc has been purchased. The Texas properties include Islander Village, a 312-bed community, and Campus Quarters, a 336-bed community, both near Texas A&M University in Corpus Christi. The third is The District on Luther, a 1,098-bed community near the Texas A&M University in College Station. An investment of $11 million is planned to upgrade unit interiors and amenities over the next two years. The properties, built specifically as student housing, include two- to four-bedroom units with such amenities as property-wide Wi-Fi; exercise, pool, outdoor kitchen and cabana facilities and large clubhouses. The portfolio is concentrated near rapidly growing universities with average enrollment sizes of nearly 35,000 students, with enrollments growing by over 20 percent since 2010 and projected to increase another 13 percent by 2020. Check out College Station Multifamily Market Research. 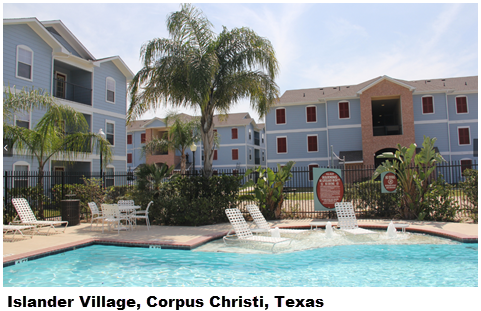 See Corpus Christi Multifamily Market Research​.